Last night I took the night off of all of my projects to take care of a sick wife… and that was the plan. Then work called because they lost power at one of the job sites and for the next three hours I was monitoring servers with one half of my brain and the other half spent trying to make Kay comfortable. I didn’t even have time to write this until this morning where thankfully she is up and around and causing all kinds of ruckus between her and our grey cat. It might seem that because I said “grey cat” that we have more than one, but that is not the case. He is the neediest animal that we have ever had. He’s been out of sorts for the past few days because Kay has been too sick to play with him the way he likes. He has been taking his frustrations out on me. Last night as I remote in to the servers to check their status, he jumps up and starts putting his cat feet on the keys to see if he can help. I just assumed he wanted me to finish my work faster so we could play. Seriously though, I am VERY pathetic when she is sick. Being married so long we men don’t know what to do any more when we’re left to our own devices… I “teasingly” at dinner time asked Kay what I was supposed to do. She laughed so hard and then started coughing and I felt bad for the ill-timed joke! This morning all is right with the world however and I’ll be finishing my beautiful Heidi Grace quilt and will post the top for all to see sometime tomorrow or Monday. 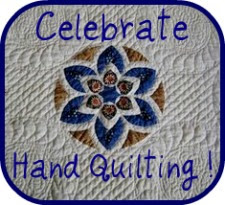 Until then… happy quilting!! Can’t say enough that I’m glad your wife if well enough to laugh at your jokes. Good luck on finishing your trasure.